ShortScale :: View topic - Plectrum for bass? 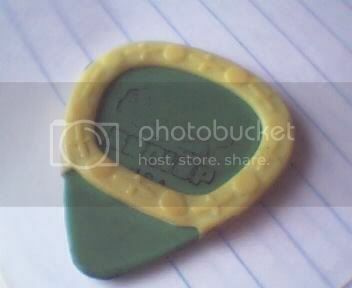 Posted: Wed Aug 14, 2013 7:37 pm Post subject: Plectrum for bass? What do bass playing plectrum users use? Something different from what you use when playing guitar? I use jazz 3s, but when playing bass, my (pansy) index finger joint hurts from the weight of the string and the stiffness of the pick. Bigger pick may help? Have been thinking about trying out one of those felt ones though to make it sound a bit more like finger picking. Same as Bearboy, only I prefer the big triangle ones. I use exactly the same as what I use for guitar which, like the other guys, is a purple Dunlop Tortex. I PLAY EVERYTHING WITH THESE LADS. This sounds like a problem i was starting to develop, caused by holing the plctrum with thumb and forefinger. A lot of 'pros' use a specific grip that I've adopted to avoid this pain. Essentially you curl all your fingers in line with the forefinger hence providing extra structural support. Have a big 'ol internet kiss from me Dave! Think I'll adopt this for bass to begin with, as I havne't had this pain playing guitar before, just bass with the bigger weight to move. Nay worries, glad to be of service! It took me a while to retrain my instincts to GET TO GRIPS LOLZORZ with the new grip but it's stuck now and I wouldn't go back. I've noticed the accuracy of my picking is better too, probably because everything is more finely stabler or somefink. just stick a bit of double sided tape on your plectrum, your hand will never cramp again. inb4 wanking your dad off while he's pissed joke. Kim Deal always says the green ones with the turtles on them! What is that round the pick? Its those coloured rubber rings that you buy at the locksmith to help tell keys apart. you can get a whole bag of them for a dollar. Looks like a top-down view of a Ninja Turtle. if you use a pick you're not really playing bass.